An allergic reaction to bed sheets is most likely an allergic reaction to dust mites, according to the American College of Allergy, Asthma and Immunology. While someone can have an allergic reaction to certain detergents and fragrances used to laundering products, the most common cause is dust mites. An allergic reaction to bed sheets is identifiable and treatable by seeing an allergist. An allergist can confirm and offer a professional diagnosis. 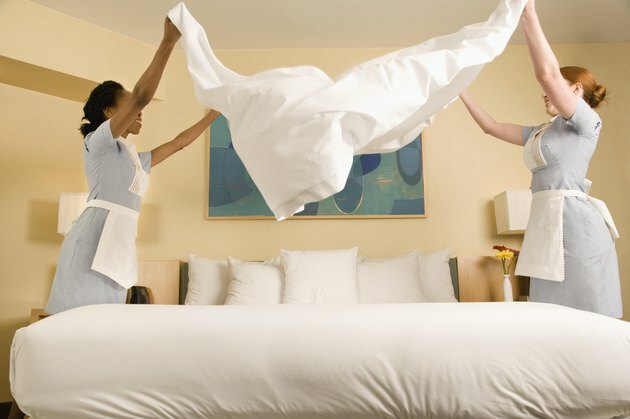 Bed sheets and other bedding are among the most common places dust mites are found, according to the Mayo Clinic. Dust mites are microscopic creatures that thrive in warm, humid fabric environments. If someone doesn't change or wash her bed sheets on a regular basis, dust mites can infest the bedding. One who is allergic to dust mites will experience the same symptoms every time he is exposed to bed sheets containing dust mites. Someone who is allergic to dust mites, has a hypersensitivity to the proteins found in dust mite byproducts, according to MedlinePlus. When the body comes in contact with dust mites it recognizes the substance as a harmful threat to the body and tries to fight it off by producing IgE antibodies and histamine. This chemical release in the body results in common allergy symptoms. The most common symptom affects the nasal passages, the eyes and the lungs, according to the Mayo Clinic. The sinus cavity becomes inflamed, causing nasal congestion, sneezing and nasal discharge. The swollen sinuses will also create pressure throughout the head, leading to facial pressure and sinus headaches. The eyes become irritated, red and can swell from a dust mite allergy. Those with allergy-induced asthma can experience shortness of breath, chest tightness and difficulty breathing. Eliminate dust mites to alleviate symptoms of an allergic reaction to bed sheets. Strip the bed of all bedding and wash it on a weekly basis in soapy water, over 130 degrees. Dry cleaning will also kill dust mites. Cover the mattress and pillows with dust mite covers that prevent mites from colonizing. Keep excessive stuffed animals or throw pillows off the bedding area to prevent dust mites from reappearing. An allergic reaction to bed sheets may the sign of a different condition and needs to be evaluated and tested by an allergist. If symptoms do not improve after implementing home treatments, talk to a doctor about possible medications that can be used to treat the allergy symptoms.